In this tutorial, we will learn How to remove duplicate records from a file by using Sort Transformation in your SSIS package. There are multiple ways to remove duplicate records in SQL Server. 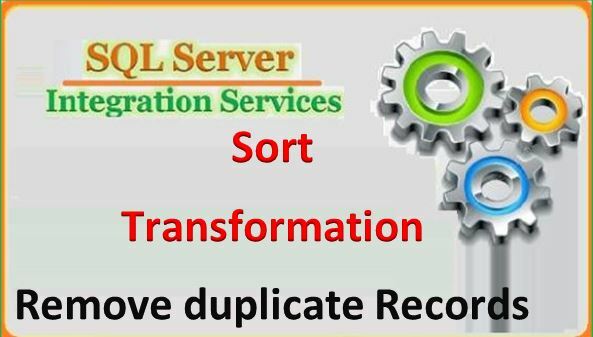 We can eliminate duplicate rows by using Sort and aggregate transformation in our SSIS package. Duplicate rows are rows with the same sort key values. The sort key value is generated based on the string comparison options being used, which means that different literal strings may have the same sort key values. The transformation identifies rows in the input columns that have different values but the same sort key as duplicates. As we know that Sort Transformation in SSIS is used to sort the source data in either Ascending or Descending order, which is similar to T-SQL command ORDER BY statement. Notice how it arbitrarily picks either "Jamie" or "Bharani" because they both have the same ID. I've never seen any requirement, ever, that says "arbitrarily pick a result, I don't care which one I get". Note: If you want to delete the duplicate records from the file then you should have to select all columns in Sort Transformation. If you try to remove duplicate columns only based on some Key columns that means you are loosing most of the data which can be required to store in your database. The Sort transformation sorts input data in ascending or descending order and copies the sorted data to the transformation output. Drag the Sort transformation from SSIS Tool Bar –> Common –> Sort. Data Validation- for data validation prospecctive, you will use a Data viewer in order to facilitate a quick preview of sorting results. To accomplish this, right click on Data Flow Path between the Sort transformation and Destination and select Data Viewers from its context sensitive menu. Conclusion - The Sort Transformation in SSIS is used to sort the source data in either Ascending or Descending order, which is similar to T-SQL command ORDER BY statement. In this tutorial, we will learn How to read header columns of a file in script task in your SSIS package. For validation of incoming record from flat files, we need to read the first row and validate with our destination table rows if it is matched then only we need to load the values otherwise we need to send the error email to concern person. It is very use full for validating before file load otherwise if we load with different records our package will get fails and again we need to debug the package and find the issue and it will go long process.